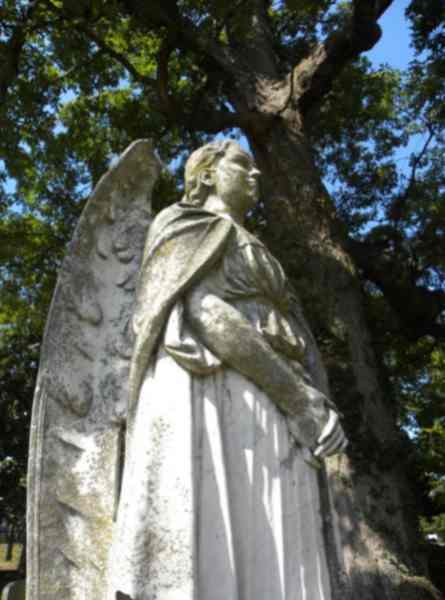 In the north-west corner of the beautiful and historic Oakwood Cemetery lays a rather notable angel statue. 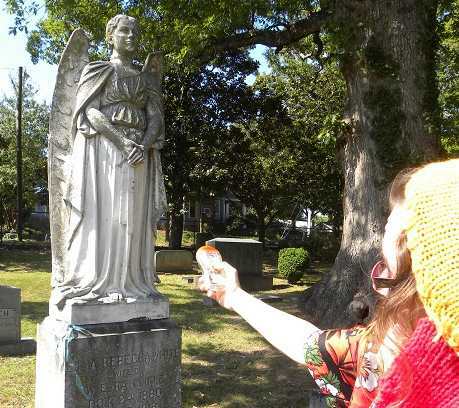 It has been known as the ‘Spinning Angel of Oakwood’, ‘The Ratcliffe Angel’ or ‘The Guardian of Oakwood’ and has become the center of some myths and urban legends here in Raleigh. The first time I had heard of the angel statue, I was only 6 or 7 while watching the kicker of a news report on a Halloween evening. The report said that supposedly at midnight every Halloween the angel’s head spins around 12 times then stops. Any ghost story that deals with something happening at precise time, and on Halloween over all times is usually a bunch of bull. The statue itself is easily visible from the fence on Watauga Street and is in the middle of a neighborhood. The angel is easily observable yet no one has been able to provide any photographic or video evidence of the angel spinning or making any movement. Other legends regarding the angel are far more subtle. Claims of the angel appearing to completely turn around if viewed at night long enough as if to keep an eye on those watching her. Others actually in the cemetery at night have said to have felt her eyes on them and could actually see her eyes following their movement. However, unlike most ghost stories, there is no real story as to why this statue would be haunted. It’s simply a grave with a nearly century old angel statue on top. While it can be hard to pin point how and when such myths and urban legends come to be, it is certain that humans love mystery and sometimes it’s purely the mystery that makes us see what we want to see. The power of suggestion in wanting to believe that a statue is haunted and can move on its own coupled with all its movement happening at night, makes for something that can easily trick your brain into seeing what you want to believe. IE: an angel statue that is looking at you or appearing to be turned around from a distance. But where is the fun in that, eh? Sometimes the mystery is far more fun than the truth. RELATED: Guide to Ghost Hunting Equipment and Paranormal Precautions. 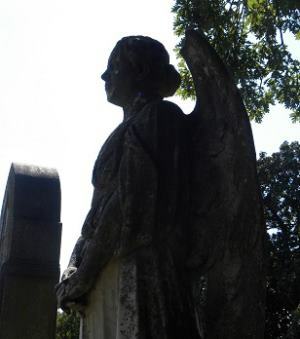 As I came back out to investigate this angel again for the sake of this article, my friend and I ran some simple tests to see if there might be anything paranormal. First we tested for EMF levels and found nothing as expected. Inspecting the statue, we did find cracks and lines around the neck suggesting that this statue has been the subject of vandalism in the past and had to have repairs. We checked around the neck for weakness and it was solid as the stone it is made of. No way can it turn its head, let alone the entire statue itself. What was interesting was the 95 cents and ribbon at the base of the angel as some kind of offering. Based on some articles I’ve read, the change has been left here for some time though it is unknown who started it as well as who left the ribbon. Nothing I found seems to suggest that this thing ever moves. What I do know is that this grave belongs to Etta Rebecca White who lived from 1880 till 1918 and passed away due to illness. 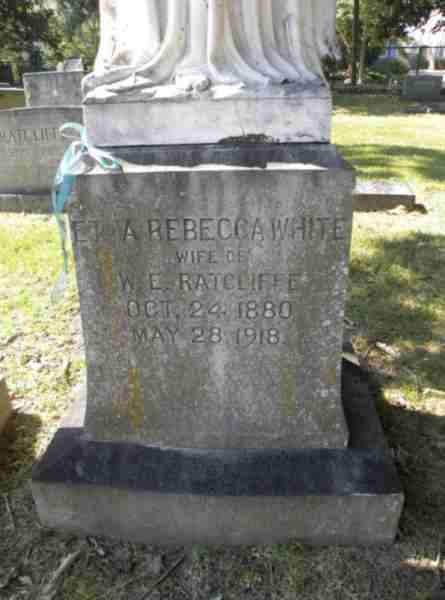 She was married to William Emmet Ratcliffe who lived from 1877 till 1941 and is buried next to her. They had two children, a Helen Wyatt Ratcliffe Winston and Virginia Etta Ratcliffe Branch of who have both passed away and buried within proximity of their parents. 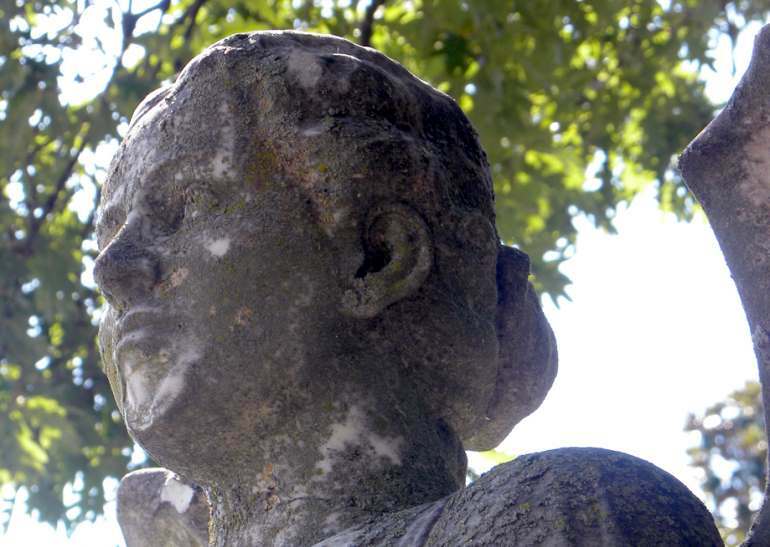 I am to assume they really loved Etta to get such an impressive angel statue put upon her grave. As I investigated and studied the grave, I came to wonder if making up such stories, like the spinning angel, dishonorable to the dead? Other ghost stories seem to have a scary or grizzly tail attached to whatever location the supposed haunted place. With the spinning angel, there is nothing. Etta, while her death at 38 was tragic, there is nothing unusual about it. There is no story as to why the angel would move or if Etta’s spirit takes control of the angel or anything of that nature. It just supposedly does ghostly things because it is creepy looking? I don’t think so. I find the theories of the head of the angel spinning because of a possible malevolent supernatural force or haunting is rather dishonorable to Etta and her family. The title ‘Guardian of Oakwood’ is a more fitting title for Etta’s angel as she can be seen as a guardian of all the souls laid to rest in Oakwood. I think that’s a far better and deserving title for the Ratcliffe Angel. Dedicated to Etta Rebecca White for keeping eyes over Oakwood and special thanks to Dorothy for helping and accompanying me to get these pictures. Last week we got this very touching message from Etta Ratcliff’s grandson Kenneth Winston. He had never met his Grandmother and thanked us for sharing information about her history he’d never learned. Honestly, I got a little teary-eyed reading it. As a history-lover, it is deeply meaningful for me to see old stories make an impact on someone’s life. Anyways, I’ll stop typing and just share the letter, published with his permission. Good morning! I have just yesterday seen your article about the Angel Statue in the Northwest corner of Oakwood Cemetery in Raleigh, NC. The statue is of my grandmother, Etta Ratcliff. My mother was Helen White (not Wyatt) Ratcliff Winston, the second daughter of Etta. Her sisters Mary Ratcliff Allen and Virginia Branch, and her brothers Bill Ratcliff and David Ratcliff, as well as my brother William Winston (who died at birth), along with their spouses are also buried there with my grandmother and grandfather. I was pleased to see the article and to learn a lot that I had never heard, particularly about where the statue came from and the arduous journey that it had to arrive at Oakwood. I never knew my grandmother, but I knew all of the others mentioned above including my grandfather who ran the small hosiery mill that looked out over Devereau Meadow long before it became crowded with development. Your article is well written and very informative—-THANK YOU FOR SUCH A NICE PIECE!!!! Oakwood is a special place for our family! We visit the cemetery at least once a year with our family during one of our trips to NCSU football games in the Fall. My family, including my wife June Bullard Winston and myself of Charlotte, NC; my son Kenneth Winston III of Tampa, Florida; my son Paul Winston of Greer, SC; my daughter Lisa Miller of Lewisville, NC; my daughter Meg MacFadyen of Nashville, TN; and my daughter Helen Phifer of Winston-Salem NC have all now seen your article and are pleased to all be a part of this “Urban Legend” that is the story of the “Spinning Angel” in the northwest corner of Oakwood Cemetery. My sister Becky Jaber still lives in the Raleigh area in a rural community near Wake Forest, NC.